Raigad Fort is a magnificent fort which was the capital of Maratha kingdom, established by Chhatrapati Shivaji Maharaj in Raigad district, Maharastra. This beautiful fort was seized by Chhatrapati Shivaji Maharaj in 1656 from Chandrarrao More, then ruler of Adilshahi dynasty, under the Sultanate of Bijapur. At that time, this fort was known as Rairi. Chhatrapati (Chhatrapati means Monarch) Shivaji Maharaj renamed it as Raigad Fort, when he was formed crowned as the first King of in 1674. This majestic fort is at an altitude of 2,700 ft or 820 meters. It is situated on Sahyadri mountain ranges. There are 1737 steps leading to the fort. There is a rope way which transports tourists to the Raigad Fort in around 10 minutes from the base rope-way station. Raigad fort trekking is also popular with tourists. Maha Darwaja, Hindi words which means Huge Door, is the gateway to the fort. From the Maha Darwaja, one has to climb another 600 feet to reach the top of the fort. Fort ruins and Palace Ruins are the major attractions inside the fort. There is a statue of Shivaji inside the fort, situated at the exact spot where his coronation ceremony took place. There is a Museum displaying Artifacts, Armory, Photographs, etc. “Shiv Teerth Raigad” is a short film screened for the tourists. Samadhi of Jijabai, mother of Chhatrapati Shivaji Maharaj, is there at the base village, Pachad. 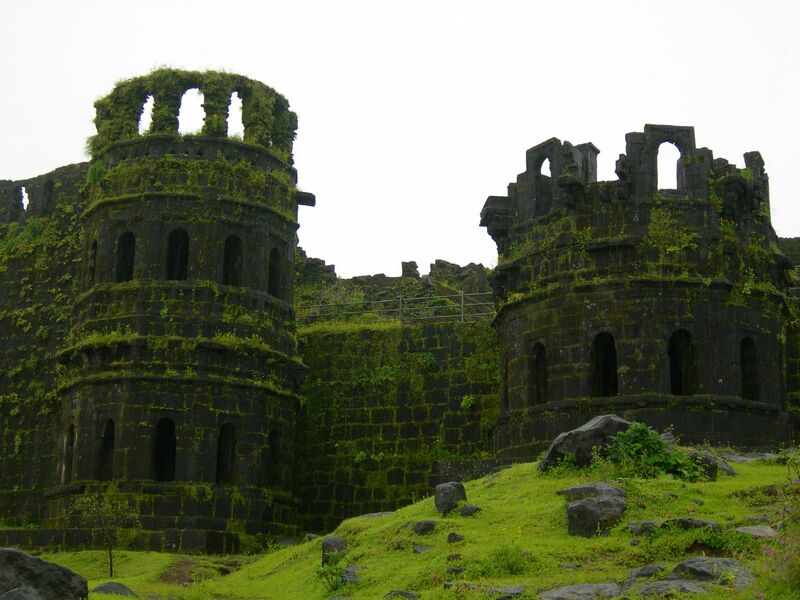 Raigad fort was captured by the British in the Third Anglo-Maratha War in 1818 . They destroyed much of the fort and the palace inside the fort. They also looted the palace. Thus the Maratha kingdom which was established in 1674, ended in 1818 with the defeat of Peshwa Bajirao II (1795 to 1818). Ganga Sagar Lake is the source of water to this Shivaji Maharaj fort. How Do I Go to Raigad Fort? Raigad Ropeway Station is at a distance of around 2.5 kilometers from Pachad, the base village. Mahad is the taluka headquarters and the nearest major town, at around 24 kilometers away. NH 66 passes through Mahad. Raigad is at around 140 kilometers to the south of Mumbai city. Raigad is at around 150 kilometers from Pune city. Veer Railway Station is at a distance around 40 kilometers from Raigad fort. This station is well connected to Mumbai and Pune. Mumbai Shivaji International airport and Pune International Airport are two nearby airports to the fort, at around 150 kilometers distance. How to Visit Rigad Fort With Minimal Spending? Don’t pay extra for any middleman. Raigad fort ropeway booking can be done only at the Ropeway Ticket Office at the base village. You can get accommodation and food also at minimal cost, if you book through the website mentioned in the earlier sentence.